Editorial Note: Hanne Haricharan is a PhD student at UCT. Her PhD research focuses on exploring how institutionalised community participation in health is able to give voice to and represent marginalised communities. In this piece she offers a personal reflection on navigating the terrain between research and intervention. I felt a tension right from the beginning of my first meeting with the health committee members I hoped would be participants in my PhD research. This tension was not from the health committee members I was meeting with – it was internal. It was a tension rooted in the fact that I wasn't sure how to be an ‘insider-outsider researcher’: someone who has an identity or experience as part of a group, but also as a researcher outside of that group. Health committee members welcomed my presentation and one after the other talked about what they thought they might learn, and how they might be 'empowered' in the process. The reason I felt uneasy about conducting my PhD research in this space was because of my previous work with health committees as part of the ‘Learning Network on Health and Human Rights’. Health committees are statutory bodies at primary health care level composed of a facility manager, a ward councillor, and various community members. Their aim is to ensure that clinics meet the needs of communities. 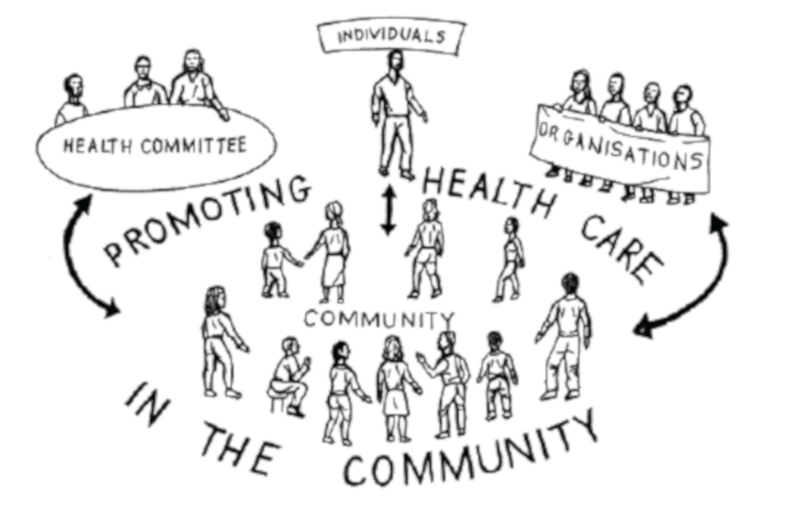 While I had not worked directly with the specific health committees that were part of my PhD research, I was an active member of the Learning Network, a collaboration of academics and civil society organisations with the stated aim of contributing to the realisation of the right to health. The Learning Network had worked extensively with health committees and included the umbrella body for health committees in Cape Town, the Cape Metro Healthcare Forum. My PhD research was situated within this broader project. The research I had conducted before my PhD had been used to design an intervention project aimed at improving the way health committees functioned. My work with health committees also extended beyond research, and included training health committee members in health and human rights. Some of the members present on the evening I presented my ideas for the PhD had also been part of the intervention project. By conceptualising my research as a reflective space, it can in some sense be considered a space that transcends the research/intervention divide, or exists as a form of intervention on its own. My association with the network and health committees thus made me both an ‘insider’ and an ‘outsider’. I was an insider because I had previously collaborated with health committees and a close relationship to this field and the people in it had developed. Simultaneously, I was an outsider because I was an independent researcher embarking on my own PhD research. This dual position had both advantages and disadvantages. I had certain kinds of knowledge and experience that helped me understand the setting well, but I also approached the research with ideas, perspectives and values about community participation that were influenced by my academic training. Further, I was concerned that being an ‘insider’ and prior partner in the Learning Network might mean that the health committee I met with had specific (practical) expectations of the research. More precisely, I thought that they might want the research to result in direct intervention and change. Conducting research within an action-orientated collaborative network that saw research as having a purpose beyond knowledge creation felt comfortable for me. My PhD project, however, was conceptualised primarily as a traditional academic project aimed at creating knowledge and developing theory. I had considered the potential value of my research for practice, but I had conceptualised the project as something that might offer recommendations and shape subsequent interventions only after my research had been finalised. I had chosen this approach because it felt like my research topic—the ways in which different forms of power impact on the day-to-day process of participation—could better be explored by observing committees over a prolonged time period as a more removed observer. I felt I would be unable to observe how health committees experienced and reacted to dynamics and differences of power within their committees if my research also focused on changing the conditions of participation. My PhD project thus required health committee members’ time and engagement without offering any tangible benefits that would have a direct impact on their committee. I was concerned that this would limit their interest in and acceptance of my research. Before I met with the health committee to explain my research, I asked myself: ‘what would make them want to be part of my research; what value would it have to them; how would the research resonate with them?’ I tried to be clear that while the research might be used to design future interventions, this was not certain. I was surprised by their enthusiastic response. Health committee members welcomed my presentation and one after the other talked about what they thought they might learn, and how they might be ‘empowered’ in the process. Despite their positive response however, I left the health committee with an unresolved uneasiness about how research and intervention related to each other in this project. The relief I felt when the health committee told me the following day that my research was approved lasted some time. My research began and proceeded relatively smoothly: I observed the health committee’s daily activities, and conducted focus group discussions and interviews. The uneasy feeling around their expectations of my research popped up only occasionally as I busied myself with data collection. About five months into the research, however, important changes began to occur in their discussions. Health committee members began to discuss how to improve problematic aspects of their participation, problems they had identified during the research. ‘We need to do something’, they said. There were many suggestions about what needed to be changed. The health committee’s response to complaints should be changed. They wanted to be part of finding solutions to problems at the clinic. They wanted to engage more with health workers. They required more information to be able to participate effectively. They wanted to call the provincial health minister to answer questions about the newly passed legislation on health committees. They wanted to know how they could better hold the facility to account. The list of what should be done went on. I began to feel uneasy again – not because of the changes they discussed but because they began to talk in terms of what ‘we’ the committee should do, in a way that included me. It became clear that they had expectations that I would participate in making the changes they wanted to implement. Specific requests on how I could help also surfaced. Could I do training on this, run a workshop on that, find information, speak to influential people, explain how the budget works etc. As time passed, I began to view my research in a similar way. I considered it a shared reflective space where understanding could be forged, meanings made, ideas discussed, and solutions explored. I listened, I took notes, I fiddled with the tape recorder. I continued with my questions while I tried to buy time to think about what had happened and how I should respond. How had I become part of the ‘we’? How could I refuse to run workshops and do training when I obviously had access to the necessary resources? The lines between research and intervention became blurred. I was partly to blame. I had told the health committee that I would like to be part of all their activities. I had been part of health committee meetings, complaint management, monitoring at the clinic, and followed them to many events and meetings in and outside their area. Perhaps it was not surprising that they felt I should also be part of changing the way it operated. I had hoped that my research participants would learn from my PhD project but I had expected that this change would happen after the research. The distinction between my research and a potential intervention had been clear in my head until this meeting, where the research participants expressed themselves as people who had their own agenda(s) and their own opinions about what they wanted and needed from the research. What should I do next? I decided to put my uneasiness and my role as a researcher on the agenda at another meeting on a different day. I planned to discuss what I could and could not do as a researcher, and why. The uneasiness and the questions I had asked myself at the beginning of my research reemerged. I recalled how committee members had specifically hoped to be empowered by the process. I was concerned about their reaction when I explained that I couldn't understand the conditions for participation if at the same time, I was trying to influence the way their committee operated. I told them that the decisions they made about what to do were theirs, not mine. Was I letting them down? Was I a researcher who had extracted knowledge from them for my own purpose, while they requested something else and wanted me to be part of that? ‘Normally we just meet. We never had an opportunity to reflect, to structure plans. Reflections play a vital role. It [my study] gives us time to reflect. Also with issues of complaints. We started thinking how come we only read complaints, but we don’t see what happens [to the complaints]’, he said. 'We get training, but it is not enough. [It is] important to reflect and that is where your project is useful’. The others agreed that my focus groups had created a reflective space that helped them to identify issues. Again, I was surprised that they accepted my explanation for why I had to remain an ‘observer’. I also began to ponder their continued use of the word ‘reflection’ and the idea that my research had created a reflective space for them. As time passed, I began to view my research in a similar way. I considered it a shared reflective space where understanding could be forged, meanings made, ideas discussed, and solutions explored. In addition, my participants were activists with strong political and organisational links so it should not be surprising that they were also focused on action. Until then, I had seen research and intervention as two distinct entities. I had struggled to clearly identify what value my research would have to my research participants in the short term (before it was translated into recommendations and plans for potential interventions). I had wondered what health committee members meant when they said that they expected to ‘learn’ from the research and be ‘empowered’. I am not sure they thought that their learning would come through their own reflective practice, although this turned out to be one of the most important benefits of my research for them. By conceptualising my research as a reflective space, it can in some sense be considered a space that transcends the research/intervention divide, or exists as a form of intervention on its own. When deciding on a research design, it can be useful to consider how action can sometimes be the direct aim of a research process. In other cases, a different approach might be required, in which knowledge is generated before any actions are taken. Later on in the research process, it became clear that if my research had been designed as an action research project, I would not have been able to observe significant ways in which the committee’s participation was constrained, nor the ways they overcame these constraints. For instance, I would not have understood how health committee members’ lack of confidence impacted on how they refrained from raising issues with the facility management, despite discussing these issues many times in meetings. Had I suggested an intervention that would improve their confidence, I would not have seen how they managed to address the issue amongst themselves after some time, by identifying that when they worked as a collective, they were better able to approach the facility manager. As my fieldwork is nearing its end, I still grapple with my role as a researcher focused on observing rather than intervening. The problem of how my research impacted on health committees remains a theoretical problem. It is clear that asking questions, exploring issues, and creating spaces for reflections have an impact. There are still times when the health committee wants me to intervene directly, but then they stop themselves. Like Neliswa, who recently asked me to step outside the role of a researcher but quickly reminded herself, and me, with a smile: ‘Oh, no, you can’t. You are a researcher. I forgot’. The images are courtesy of the Learning Network for Health and Human Rights. The images were cropped but not otherwise altered. Hanne Haricharan is a PhD candidate in Public Health at the University of Cape Town and a Researcher in the Health and Human Rights Programme at the School of Public Health and Family Medicine, UCT. Her research focuses on exploring how the institutionalised community participation in health is able to give voice to and represent marginalised communities.